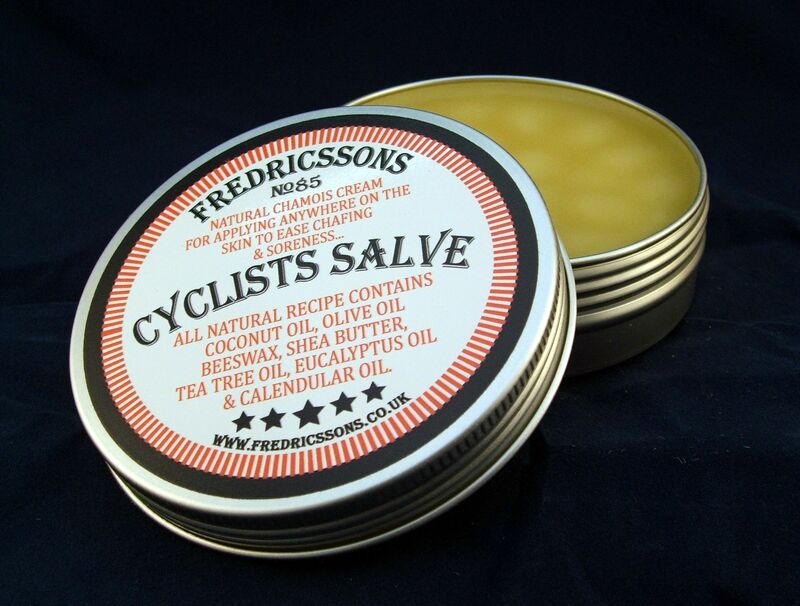 These two products, the Cyclist Salve & the Tattoo Cream are more or less the same formulation, the only real difference is the Cyclist Salve has a higher percentage of eucalyptus Oil as this helps when using as a Chamy Cream as it gives a cooling soothing effect & a nice fresh smell. As a very keen cyclist I have used all types of chamy creams over the years and tend to find that most are sticky Vaseline like products that felt horrible to use and tended to block the pores. Nowadays there are some good products on the market but alot purporting to be natural are in fact not. I also wanted to find a One Stop Cream that could be used all over for rashes, chaffing,bites, sunburn etc and would be great to pop into your cycle bag for trips away. With so many people having tattoo’s I see alot that have badly faded and dried out. 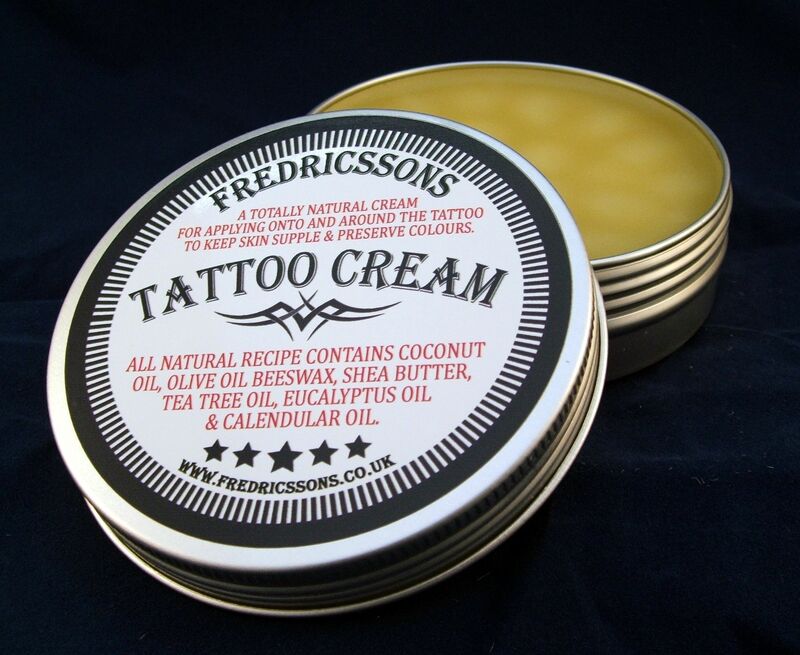 The Fredricssons Tattoo Cream is basically a high end cream, containing only natural ingredients including shea Butter, Coconut oil, Olive Olive but with added essential oils to heal & cleanse the skin and to help fight any inflamation & infection, when the Tattoo is new, and then protect & rejuvinate the skin ongoing. Coconut oil is the all-in-one natural solution to all your skin problems. It soothes bug bites, speeds healing, helps with rashes, gets rid of flaking skin, softens and shrinks wrinkles, protects against sun damage, keeps tans longer, acts as an antioxidant to prevent cellular aging, and so much more. Olive oil contains three major antioxidants: vitamin E, polyphenols, and phytosterols. Antioxidants, when topically applied, may help protect the skin from premature skin aging. It helps restore skin smoothness and protects against ultraviolet light. Hydroxytyrosol, a rather rare compound found in olive oil, also prevents free radical damage to the skin. Beeswax is used in many skin care products because it provides a protection against irritants while still allowing the skin to breathe. It also offers anti-inflammatory, antibacterial and antiviral benefits making it helpful in treating skin irritation. Tea tree oil has been long valued for its antifungal, antibacterial, and antiviral properties. In the 1920s, it was used in dentistry and surgery to clean wounds and prevent infections.Surgeons believed that it is more effective than carbolic acid, the commonly used antiseptic at that time. Has great anti-inflammatory and vulnerary action, making it helpful with stubborn wounds, acne, ulcers, bed sores, varicose veins, rashes, eczema, and related conditions.7 It addresses sore, inflamed, and itchy skin conditions. Used as an antiseptic, insect repellent, and treatment option for wounds, burns, and ulcer.